Gym-Masters, Southern's anti-drug acrobatic team, has wowed crowds of school children, NBA fans (during half-time shows for the Chicago Bulls), and Southern students for more than 25 years. Gym-Masters promotes a positive, healthy lifestyle through its roof-raising performances. 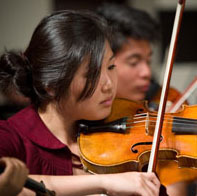 Through the School of Music, students can join three choirs and four instrumental groups. The campus is also alive with talented musicians who form their own independent bands from almost every genre.